What is RSD? Reflex Sympathetic Dystrophy (RSD), also known as chronic regional pain syndrome, is characterized by pain, swelling and abnormal sympathetic nerve activity in the affected hand or extremity.The pain is out of proportion to the injury that triggered it. RSD is usually associated with an injury, which can sometimes be as minor as a paper cut or small bruise. It causes nerves to misfire and send frequent or constant pain signals to the brain. The sympathetic nerves become overactive, causing intense burning or aching pain, along with swelling and changes in skin color, moisture, and temperature. Who gets RSD? It can begin after a minor injury, such as a sprain or small laceration, or after major trauma or surgery. Injury to a nerve may also provoke its onset. It is most common among individuals between 25 and 55 years of age, though anyone of any age can be affected. RSD is three times more likely to occur in women than men. An estimated 3 to 6 million Americans suffer from RSD. Sign and Symptoms of RSD Severe burning pain is usually constant and occurs in areas other than the primary injury site. The pain is often out of proportion to the severity of the injury and lasts longer thanCAexpected for the type of injury. Swelling may be localized or involve the entire extremity. Abnormal hair and/or nail growth may occur. The skin is often warmer than in other areas, and may appear shiny and thin and may exhibit increased sweating.The affected hand will have limited mobility. The symptoms vary in severity and length in each case. Diagnosis of RSD There is no simple test to confirm a diagnosis of RSD. Patients must be examined by a qualified physician who does a through history and physical examination.Xrays, bone scans, and thermography are sometimes helpful. A good response to a stellate ganglion block also supports a diagnosis of RSD (see Treatment). Consultation with other specialists may be needed, and often a pain clinic is recommended. Treatment of RSD The earlier that the diagnosis of RSD is made and treatment started, the better the chance of full recovery. The treatment is varied and depends on both the severity of the symptoms and the duration of the problem. Some patients may have a chronic physical problem, such as an irritated nerve, that needs to be addressed to help with the pain. Since there is no simple cure for RSD, treatment is intended to relieve painful symptoms so that patients can resume their normal lives as well as continue to use the hand or extremity as much as possible. Any of the following may be employed to treat RSD, often in combination. Therapy: an increasing exercise program to help with motion may help preserve or restore mobility and function to the affected hand. Psychotherapy: RSD may have profound psychological effects on patients and their families. Many with RSD suffer from depression, anxiety or posttraumatic stress disorder. 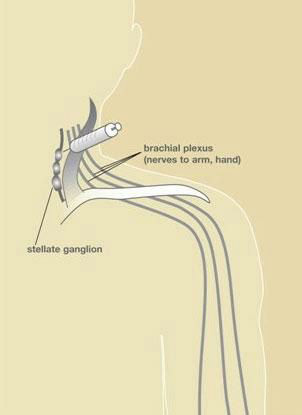 Sympathetic nerve blocks: many patients experience significant relief from nerve blocks, in which local anesthetic is injected to numb the stellate ganglion, a cluster of sympathetic nerves at the base of the neck (see Figure 1). By relieving pain, blocks can enable more effective therapy. Medications: many different drugs are used to treat RSD, including topical analgesics, antiseizure drugs, antidepressants, corticosteroids, and opiods. Surgery: If the RSD is from a compressed nerve, such as with carpal tunnel syndrome, then surgery to release pressure on the nerve may be needed (i.e. carpal tunnel release). Occasionally an operation known as sympathectomy is used to divide the sympathetic nerves in patients that are helped by nerve blocks, but its use is controversial. Other options include spinal cord stimulation and intrathecal drug pumps, in which pain medications are injected continuously into the space around the spinal cord. Prognosis Each patient with RSD responds differently to treatment. Spontaneous remission occurs in some persons. Others may have crippling irreversible changes in spite of appropriate treatment. Most physicians believe that early treatment is helpful to limit the disability from RSD. More research is needed to understand the causes, the development of the disease, and how treatment can alter its course.